Kenya's Faith Kipyegon won the women's Olympic 1,500 meters on Tuesday after unleashing a devastating burst in the second half of the race that left Ethiopia's world record holder Genzebe Dibaba trailing in her wake. Kipyegon, fastest in the world this year, sat in a pack that virtually jogged the opening stages before she and Dibaba pulled clear with a 56.8-second lap around the halfway mark that scattered the field. Dibaba, who has struggled with injury this year, led with 200 to go but the 22-year-old Kipyegon forced her way past and drove for the line to win in four minutes 8.92 seconds and reverse the order from last year's world championship final. 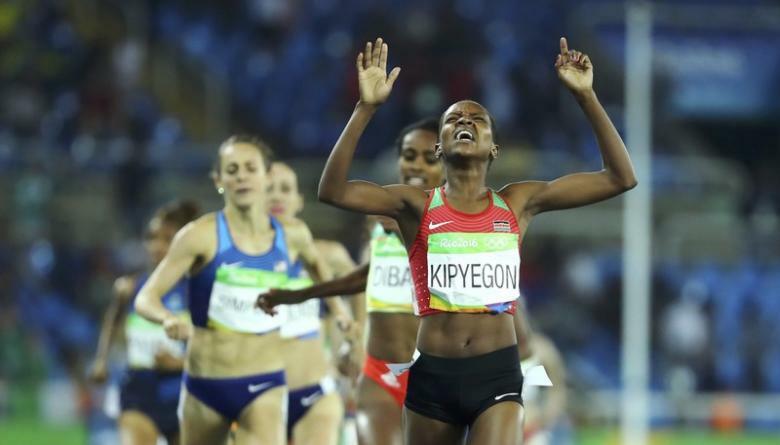 "It was an amazing race," Kipyegon told reporters. "I needed to focus for the middle because I knew Genzebe is so fast and I really had to kick on the last lap." Dibaba held on for silver, with American former world champion Jenny Simpson taking bronze. Another American, Shannon Rowbury, finished fourth to suffer more frustration after being cheated out of a medal four years ago when finishing sixth. The 2012 event in London has been dubbed the "Dirtiest Race in History" with six of the top nine finishers, including the gold and silver medalists, committing doping offences before or after the race. Winner Asli Cakir Alptekin is serving an eight-year ban for her second offense while fellow Turk Gamze Bulut, who had improved her personal best by an eyebrow-raising 18 seconds, is also suspended. There was also a cloud hovering over this year’s race following the arrest in June of Jama Aden, Dibaba's coach, after an anti-doping raid, though the Ethiopian has never failed a test. After her stellar 2015, Dibaba struggled with injuries this season but seemed to be running into form as she qualified fastest for a showdown that contained eight of the women who contested the world championship final in Beijing last year. That quality was not on show early on, however, as they jogged through the first lap in 76 seconds and went through 800m in a pedestrian 2:27.21. Dibaba then pressed the accelerator, however, and only Kipyegon and Briton Laura Muir could respond. The Ethiopian led at the bell but her diminutive rival sat perfectly poised on her shoulder before driving clear in a 58.79-second last lap. Muir faded, allowing the American duo to battle it out for bronze with 2011 world champion Simpson prevailing to earn a first medal for her country since the event was introduced in 1972. "Being the first is something I’ve not allowed myself to think about," said the 29-year-old, who is appearing at her third Olympics. "At the start line I thought to myself, 'this is what I’ve worked and prayed for, just to have a shot,' and then I was able to execute. "This has been a long ride of highs and lows and I've done it honestly and clean with everything that's inside my own body."